We’d love your help. Let us know what’s wrong with this preview of My Sister’s Lies by S.D. Robertson. When Dian For a decade, Hannah’s life has been pretty close to perfect – she has a great job, she’s married to Mark, and her child-free existence means she’s free as a bird. The only sadness in her life is a fall-out with her sister Diane, who hasn’t spoken to her in over ten years. But now Diane is on her doorstep – and this time, she’s got her teenage daughter Mia in tow. To ask other readers questions about My Sister’s Lies, please sign up. I received a copy of My Sister's Lies by S.D. Robertson from NetGalley for my honest review. A story of twin sisters, Diane and Hannah, who haven't spoken to each other for ten years. Hannah, is a happy woman and has a wonderful husband named Mark. Then one day, Diane is on Hannah's doorstep with her fourteen year old daughter, Mia. . Diane asks her sister to look after Mia for a few days, so she can get some things in her life in order. She agrees, mostly because she wants to get to know her Nie I received a copy of My Sister's Lies by S.D. Robertson from NetGalley for my honest review. A story of twin sisters, Diane and Hannah, who haven't spoken to each other for ten years. Hannah, is a happy woman and has a wonderful husband named Mark. Then one day, Diane is on Hannah's doorstep with her fourteen year old daughter, Mia. . Diane asks her sister to look after Mia for a few days, so she can get some things in her life in order. She agrees, mostly because she wants to get to know her Niece, but days have gone by and now they are weeks and Hannah is worried. Where is Diane? Why hasn't she come back? Did something terrible happen? 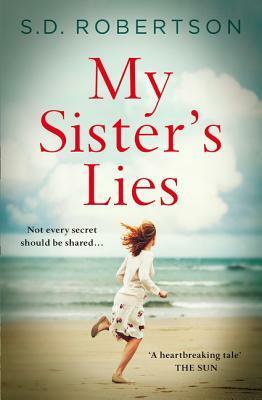 My Sister's Lies is a gripping and taut story of family, secrets, lies and drama. Hannah and her twin sister Diane don't have the best relationship, so when Diane turns up on Hannah's door asking for Hannah to take care of her daughter Mia for a little while, Hannah can't say no! Despite their awkward relationship, Hannah adores her niece. But as time flies by, Diane still hasn't contacted Hannah and she's beginning to worry. What has happened to Diane, can Hannah find her before it's too late? I love the thriller feel to this book, it had a dash of suspense, it was taut, emotional, gripping, the characters are complex, flawed, but strong and well written. It really toys with your emotion. Overall a Compelling read that draws you in, its a slower paced emotive read that is cleverly written, with a few lil twists to keep you on your toes. Sometimes I wonder what life is all about, and then I read a book like this which deals with tough topics like suicide, loss of a sister, and devastating lies. This might seem to be a fictional tale, but with billions living in this earth, it might have happened to someone. S. D. Robertson has taken this slice of life about a wickedness, a jealousy, and the need to feel better about oneself and written a story about two sisters Hannah and Diane. The story goes thus, Hannah and Mark lead a happy Sometimes I wonder what life is all about, and then I read a book like this which deals with tough topics like suicide, loss of a sister, and devastating lies. This might seem to be a fictional tale, but with billions living in this earth, it might have happened to someone. S. D. Robertson has taken this slice of life about a wickedness, a jealousy, and the need to feel better about oneself and written a story about two sisters Hannah and Diane. The story goes thus, Hannah and Mark lead a happy childless life when Hannah's sister Diane, out of the blue, leaves her daughter Mia with them apparently for a few days as she sorts out her life. Both the sisters have had a fallout years ago and no longer speak to each other till this day. A tragedy occurs and secrets are revealed, some innocent, some played. The whole story deals with the repercussions of it all. The book which has vibes of a thriller, is a family story and it just squeezes the heart at some points. The only niggle I had was some parts felt slow, but that may be because I am used to the thriller pace. S D Robertson's writing felt smooth for most parts, the last few pages made me cry... One can't hate the other who is dead, it's a waste of energy. Love surpasses all that. If you want a story that will tug at your heartstrings, characters that will engage and connect with you at every turn, and a plot that will keep you gripped the whole way through, then look no further than MY SISTER'S LIES by S.D. Robertson. S.D. Robertson writes excellent books about messy lives and true emotions and MY SISTER'S LIES is no exception. The characters have all mucked up in some shape or form which is relatable and as they try to navigate the secrets and lies, as a reader I could really feel their pain and shock, their heartache and their need. Yet again, this talented author made me cry with his words and I defy any of you to turn the last page and not feel a lump in your throat. This is a well-crafted, thought provoking novel about forgiveness, family and - of course - secrets. There's an element to mystery about it, as the book opens with an unnamed woman preparing for something quite dramatic which we can sort of work out, but we don't know who it is or when it's occurring. Then the narrative switches to Hannah and her husband Mark, who is visited by her estranged sister Diane and her daughter, Mia. Diane asks them to take Mia in whilst she sorts 'something important' This is a well-crafted, thought provoking novel about forgiveness, family and - of course - secrets. There's an element to mystery about it, as the book opens with an unnamed woman preparing for something quite dramatic which we can sort of work out, but we don't know who it is or when it's occurring. Then the narrative switches to Hannah and her husband Mark, who is visited by her estranged sister Diane and her daughter, Mia. Diane asks them to take Mia in whilst she sorts 'something important' out. What follows is an emotional story that slowly unpicks those incidences in the pasts of Hannah, Diane and Mark which led to such a rift between the sisters and them not speaking for over 10 years. I was really intrigued as to what would happen, and although I did guess at quite a lot of what happened, it didn't hamper my enjoyment at all. Things get really messy, and no character is painted as completely guilt-free or perfect, which I felt was so much more real and believable. The story kept me wanting to keep reading from start to finish, and I now want to read many more novels by S.D. Robertson. I have read a couple of of S.D. Robertsons books before but My Sister's Lies, by far, tops them. Brilliantly written with lots of twists that keeps you wanting more. If you like your mysteries with a lot of emotion–the sort that make you tear up (okay, downright weep)–this is the book for you. S D Robertson introduces us to two sisters, Hannah and Diane, who have spent the last dozen or so years largely estranged. The one tie that remains is Diane’s daughter Mia, whom Hannah wishes she knew better. The opportunity for that presents itself when Diane shows up, Mia in tow, and asks Hannah to watch her for a few days. When a few weeks go by and Diane isn’t in touch, Hannah goes in search for answers. Some will shock and baffle her, some will sadden and nearly break her. This book is almost impossible to put down, despite a prologue that kind of gives away a few things. I’ll say this much: the prologue made me want to know what happened, and with each plot twist–some major, some minor–I kept turning the pages. Hannah, her husband Mark, and Mia are all well-developed characters. Yes, at times Hannah seems a little too willing to go along with things she doesn’t truly want, which can be frustrating, but she’s likable. You see what this distance with her sister has done to her, and as she tries to find out what happened with Diane, you suffer with her along the way. Mark starts off fairly one-note but becomes far more complex, and Mia will capture your heart. My complaint: Diane. She’s so totally unlikable that I kept wishing the worst for her. But … I mean … maybe not the worst that S D Robertson had in mind. This is a solid mystery, one you can read over a weekend. Let me know what you think of it. This didn’t really do much for me. I felt like a lot was given away towards the beginning, and so I wasn’t shocked as things came out later. Another thing that bothered me was how often we’re hit over the head with “Mark never wanted children, after a trauma in his childhood” it took so long to hear what the trauma was, but that it existed with no detail kept being restated. The same for the event that caused the sister’s rift. I just was let down to find out the background stories to both of th This didn’t really do much for me. I felt like a lot was given away towards the beginning, and so I wasn’t shocked as things came out later. Another thing that bothered me was how often we’re hit over the head with “Mark never wanted children, after a trauma in his childhood” it took so long to hear what the trauma was, but that it existed with no detail kept being restated. The same for the event that caused the sister’s rift. I just was let down to find out the background stories to both of those. "My Sister’s Lies" by S.D. Robertson. Really good! I loved the way it started and knew I was going to enjoy that book right away. It just felt a little slow around (before) the middle then wow! I loved the characters, I felt their emotions. These situations must be so hard to go through! I am glad my sister and I are close and don't have secrets... at least not that kind! And we would never let each other go through things alone. Thank you NetGalley and "My Sister’s Lies" by S.D. Robertson. 3.5 stars. This was a good book with a smooth read and believable characters. It wasn't my usual genre, but I did enjoy it. It kept my interest well and had a few decent surprises along the way. This is how “My Sister’s Lies”, S.D. Robertson’s fourth novel, begins. This is the story of a family that has been struck by tragedy one time too many. It is the story of two estranged twins, Diane and Hannah, that circumstances will bring back together after 11 years spent apart. It is the story of 15 years old Mia, daughter of Diane, who she brought up alone and to whom Mia is her everything. It is also the story of Mark, Hannah’s loving husband, and of the effects that Mia and her mum’s appearance will have into the perfect life he has been carving together with his wife in the last decade. Mark and Hannah have no children of their own, a choice they mutually made before getting married. Nonetheless they accept the challenge to have teenager Mia staying with them for as long as Diane needs her to be. It’s the reason why she showed up in Manchester after twelve years of living in Bournemouth. She will have to go away for a while to sort out some unfinished business down South. Now, if you did not read the book and ignored the “spoiler alert” at the beginning, I would suggest that you stop reading here. As part of the beauty of this story resides in the final twist that will make sense of the whole mess the characters found themselves in. Sure, I could conclude my review here, but hey, by doing that I would deprive myself the pleasure to tell you what I liked most, so bear with me!! I liked the tension between the two sisters I could feel all along the story. I liked the goodness in Hannah and, strange enough, also Diane’s weaknesses, due to her envy and jealousy towards her sister’s persona and life. I liked how easy and simple it felt to read this book. The story flows always at the same pace, without causing bursts of adrenaline nor bored yawns. The dialogues feel so real that I sometimes had to remember it was fictional characters I was reading about. Suppose that’s down to Robertson’s background as a journalist. Right words chosen and placed just at the right place to give sentences’ construction and dialogues that added real feel by cutting off the unnecessary. I plead guilty there, too. I am the one who cut over 400 pages off the second draft of my book. Everything’s essential in a story for its author. Even when the essential means wasting two A4 pages describing the living room of a character we first meet in that chapter and will never see again afterwards. But I’m going off topic here, sorry peeps. Let’s go back to My Sister’s Lies: did I like it? ‘Suppose my 500-something words review should confirm that, but as I do not expect you to count them I would simply add another one: yes. I did like this book. I liked it because I could picture each corner and place in Manchester the characters visited and went – kind concession of me having lived here for donkey’s ages. I liked it because, in a way, with its tragic ending the story of these two sisters provides some kind of a cross-section of normal people’s life. Hannah and Mark have a life many dream of. On a whim they can pack up their bags and head off to the airport or spend an evening in a top-class restaurant. But life hasn't always been like that, as Hannah has been dealing with her own demons for a number of years. Hannah had a major disagreement with her sister, Diane, some time back, following the death of their mother. The damage was irreparable, causing Hannah many years of anxiety and pain. With the help of counselling and Mark's patience, Hannah came through it. Having always dreamed of being a writer, Hannah made changes in her life and now works from home, with her debut novel about to be published and her second book a work-in-progress. Mark's job is both successful and secure, allowing her to fulfill her dreams and Hannah is happy. Hannah's world is upended as old memories come back to haunt her. She accepts Mia into her home, as she relishes the opportunity of reacquainting herself with her niece, but she fears for the Pandora's box that is about to opened. Diane is very cagey about her reasons and Hannah doesn't push too hard, but after a few days when there has been little communication from Diane, Hannah begins to get a little concerned. Diane has had a chequered past. Growing up she struggled with life and relationships, always striving to be the popular one, the girl everyone loved. As the years passed, Mia arrived into her world and Diane's life changed dramatically. After the death of her and Hannah's mother, Diane was in a tough place and following the disagreement with Hannah, she never could find a way to right some wrongs. Now Diane's story is about to change and she needs Hannah back in her life. Will Diane and Hannah past history prove to difficult to overcome? Can the sisters reunite or is the damage already done? ﻿My Sister's Lies tells the story of many different relationships. Hannah and Diane, sisters, have a history together, one that is revealed slowly as the pages unfold. They have quite a complex sibling dynamic, one that has seen many highs and lows over the years and now is facing it's biggest challenge yet. Hannah and Mark, husband and wife, have been together for a number of years. Meeting quite young and falling in love, their marriage has stumbled through many obstacles, yet strengthening over the years into a very stable union. Diane's appearance exposes a few cracks but can their love see them through this testing period? Hannah's life is pretty much perfect - she is just about to publish her first book, she is happily married to Mark and they life in a beautiful apartment in Manchester, enjoying their child-free existence. The only sadness in her life is her ongoing feud with her sister Diane, whom she hasn't spoken to for 10 years after a huge argument just after their mum died. But as the book starts, Diane is back on Hannah's doorstep unexpectedly, with her 14 year old daughter Mia in tow. Mark and Hannah assum Hannah's life is pretty much perfect - she is just about to publish her first book, she is happily married to Mark and they life in a beautiful apartment in Manchester, enjoying their child-free existence. Mark and Hannah assume Diane is down on her luck and wants money from them but what is actually wants is for them to look after Mia for her while she has to sort some stuff out. After a few awkward days while Mia settles it, Hannah is thrilled to be able to bond with her niece again, whom she hasn't seen since she was a toddler. Diane is carrying a devastating secret that will destroy Hannah's carefully constructed life. But how much is she willing to reveal and when will she pick her moment? Mia seems like a lovely girl - she isn't sure about being left with her Aunt and Uncle to begin with. She actually gets on better with Mark than Hannah. Her typical teenage habits get on Hannah's nerves (towels on the floor, messy bedroom etc) but they soon bond over their love of books and reading. We learn Hannah has had a breakdown in the past (linked to her mother's death) and she still sees a therapist. Unfortunately I didn't like Diane at all. She isn't a very sympathetic character and I'm not sure I warm to her at any point or actually have much compassion with the choices she makes. I was surprised to find out S D Robertson is a man as I think this genre of books are usually written by women. Without wanting to sound patronising, I think he did a really good job with all the characters voices. The relationship between sisters is the main crux of the story. As the saying goes, "We can't choose our family" and the book looks at the problems different personalities bring, how parents feel and treat their children, and resentments and rivalry between siblings. As someone who enjoys listening to true crime podcasts (which is kind of strange to say), As a British ex-pat, I prefer the calm voices of the British ones, and when I chose this book to read, I felt from the synopsis that this could quite easily have been real life! Well, at least in the small Essex Town that I a I'm going to warn you all now that this book tackles a lot of tough and somewhat taboo subjects, so if you are sensitive to the discussion of suicide, please do not read this book. ‘Wait, what?’ I would think and then have to scroll back through everything I'd previously read in my head, asking myself why I hadn’t added up the clues before. They were definitely there but S D Robertson is a master of dropping little morsels of information that might seem insignificant but you soon realise are clearly relevant in the end. There’s no gentle easing in to this book, he smac Every so often while reading My Sister’s Lies, a big dinner gong felt like it went off right beside my ear. There’s no gentle easing in to this book, he smacks you in the face with the story right from the start. I was lounging on the sofa but it made me sit up straight. I really like it when something dramatic happens right at the beginning (no spoilers) but you’re not sure who is speaking and it keeps you guessing. This was one of those stories where I really wasn't sure how it would end. I felt like it could go several ways but I was satisfied with how everything was resolved. Another powerful novel to add to Stuart's growing list. This book opens with a jaw dropping first chapter ensuring that you don’t put it down, Hannah gets a shock when her twin sister Diane and teenage niece Mia, turn up on her doorstep. She hasn’t seen or spoken to them for over ten years after a major argument following the death of their mother, which has caused Hannah a lot of pain and anxiety over the years. Hannah is married to Mark and now has a successful career as an author. Mark didn’t want children so when Diane asks them if they will look This book opens with a jaw dropping first chapter ensuring that you don’t put it down, Hannah gets a shock when her twin sister Diane and teenage niece Mia, turn up on her doorstep. She hasn’t seen or spoken to them for over ten years after a major argument following the death of their mother, which has caused Hannah a lot of pain and anxiety over the years. Hannah is married to Mark and now has a successful career as an author. Mark didn’t want children so when Diane asks them if they will look after Mia for a few days as she has things to sort out, Hannah is very wary. The few days pass and they hear nothing from Diane so Mark goes to her home. Then the secrets and lies start to be revealed. The story goes back in time to the sisters childhood and teenage years and explores what happened and examines their relationship. I found this book an enjoyable read, but disappointing as, for me, it lacked in suspense and surprise. My Sister’s Lies was an ok read it just lacked any suspenseful buildup towards the main topics of contention. Hannah and Mark live a nice life in Manchester, Mark has never wanted children and Hannah has accepted that and as a result have a fun filled life doing what they want, when they want until Hannah’s sister turns up after not speaking to each other for over a decade with her 14 year old daughter in tow. Diane leaves Mia in the care of Hannah and Mark for a few days as she needs to sort her My Sister’s Lies was an ok read it just lacked any suspenseful buildup towards the main topics of contention. Hannah and Mark live a nice life in Manchester, Mark has never wanted children and Hannah has accepted that and as a result have a fun filled life doing what they want, when they want until Hannah’s sister turns up after not speaking to each other for over a decade with her 14 year old daughter in tow. Diane leaves Mia in the care of Hannah and Mark for a few days as she needs to sort herself out and here is where the lies start to appear. This could have been so good but the build up to why Mark didn’t want children was a good build up but then it was revealed and it all felt flat and almost insignificant. The twist to the tale I got near the beginning and so wasn’t as much of a shock as it could have been. I did enjoy this at times emotional read but it just lacked the suspense for me. I've always enjoyed emotional books, but lately I've been struggling to feel as emotional as usual. I'm reading books that are supposed to make you sad, and I know that in the past they would have made me sad, but I just feel nothing instead. I had the complete opposite with this book. I would be reading, not even realising how emotional I'm feeling and next thing I know, tears would be hitting my pillow. The first chapter, which showed the death of one of the characters, was a complete shocker a I've always enjoyed emotional books, but lately I've been struggling to feel as emotional as usual. I'm reading books that are supposed to make you sad, and I know that in the past they would have made me sad, but I just feel nothing instead. I had the complete opposite with this book. I would be reading, not even realising how emotional I'm feeling and next thing I know, tears would be hitting my pillow. The first chapter, which showed the death of one of the characters, was a complete shocker and drew me in straight away. Despite this, it made me worry about the rest of the book though as I thought chapter one was too much of a spoiler. I was wrong. Chapter one was just a small part of a book with many, many layers to it leading up to the death, plus unresolved issues from before the death finally resolved. And every time I thought I had finally found out everything, new information would be dropped in. First, thanks to #NetGalley for the opportunity to read an e-galley of this book. Get your tissues! I loved this story, the suspense, the twists and turns, and the family ties and all that goes with it. Hannah has a good life, great husband, Mark, whose job allows her to follow her dream of being an author. She has a sister, who she had a falling out with 10 years ago, and they haven't spoken in all that time, which means she hasn't seen her niece since then. So, when her sister, Diane, shows up First, thanks to #NetGalley for the opportunity to read an e-galley of this book. So, when her sister, Diane, shows up on their doorstep with Hannah (niece) in tow, asking if they can keep her for a few days while she gets some things in order, Hannah and Mark are quite surprised, but of course, will do what they can to help. Hannah and Mark have a happy but childless marriage when Diane, Hannah’s estranged sister turns up on the doorstep asking them to look after Mia, their niece, for a short time. She doesn’t explain why, only that she has something to take care of. But Diane isn’t being entirely honest and you know that her actions are going to have a devastating affect on the family. The author does a convincing job of creating three voices, I could appreciate Hannah’s attempts to make Mia more comfortable and not Hannah and Mark have a happy but childless marriage when Diane, Hannah’s estranged sister turns up on the doorstep asking them to look after Mia, their niece, for a short time. She doesn’t explain why, only that she has something to take care of. But Diane isn’t being entirely honest and you know that her actions are going to have a devastating affect on the family. The author does a convincing job of creating three voices, I could appreciate Hannah’s attempts to make Mia more comfortable and not let her annoyance with Diane dominate, Mark’s guilt over the past, and Mia’s confusion over her mother leaving her with relatives she couldn’t remember. The story takes place in Manchester, I always enjoy reading a novel about somewhere I know so could appreciate the references to the Central Library, the museums and the parks. I enjoyed seeing Hannah start on her second novel, whilst enjoying the build up to the publication of her first. Another great read by S D Robertson, as this story examines a whole range of emotions mostly brought about by secrets and lies. There are four central characters, Hannah her husband Mark, Hannah’s twin sister Diane and Diane’s daughter Mia. They each have a difficult relationship with each other mainly due to events which occurred years ago. These are revealed as the story progresses with Mia being the only innocent one in my eyes. When Diane and Mia suddenly turn up on Hannah’s doorstep after an Another great read by S D Robertson, as this story examines a whole range of emotions mostly brought about by secrets and lies. When Diane and Mia suddenly turn up on Hannah’s doorstep after an absence of over 10 years, then leaving Mia in her care, a whole host of questions and worries set a new roller coaster in motion. I think both Hannah and Diane had their faults and both felt guilty that they had allowed over a decade to pass with neither of them speaking. Hannah turned to counselling during this time and some of the sessions are included chapters in this book. Diane however focused on raising Mia and being the best Mum she could be as a single parent. My thanks to NetGalley for the digital ARC, this is my own opinion of My Sister’s Lies. Wow, this book was a shocker for me. I didn't expect it to pull quite so much at the heartstrings as it did, and I must admit I did shed the odd tear. The story flows nicely, although is a little slow in parts. The characters are well developed and are flawed and relatable. No fireworks with this one, it was a reasonable read but lacked suspense which made it rather slower than I would have liked. The ending was quite predictable in fact I had guessed early on what had happened and tied in pretty quickly who had committed suicide. No a fan of the transcripts but they did give additional background so I suppose they were relevant although there was so much explanation on feelings in almost every page that the reader would have got the point without the transcripts any No fireworks with this one, it was a reasonable read but lacked suspense which made it rather slower than I would have liked. No a fan of the transcripts but they did give additional background so I suppose they were relevant although there was so much explanation on feelings in almost every page that the reader would have got the point without the transcripts anyway. I confess I skim read these anyway as they were not revealing anything new. Didn't really excite me; an adequate read but really rather ordinary so can only give this one a 3 star rating. My sister’s Lies by S D Robertson is not at times an easy book to read, dealing with the suicide of one of the main characters made that a foregone conclusion. It does however go back in time to the sisters childhood and teenage years to examine when they went their separate ways and why. The relationships between sisters, Hannah and Diane and with Mark and Diane’s daughter Mia are all closely examined. So that With thanks to Netgalley and the publishers for the arc, which I have enjoyed reading. My sister’s Lies by S D Robertson is not at times an easy book to read, dealing with the suicide of one of the main characters made that a foregone conclusion. It does however go back in time to the sisters childhood and teenage years to examine when they went their separate ways and why. The relationships between sisters, Hannah and Diane and with Mark and Diane’s daughter Mia are all closely examined. So that eventually you come to understand the events leading up to Diane’s death and why she took the drastic and dramatic steps to end her life in the way that she did, even if you may not agree with them. Hannah and Diane are identical twin sisters with an estranged relationship. When Diane shows up at the home of Hannah, which her daughter Mia, Hannah and her husband Mark do not understand what is going on. Diane leaves Mia for a few days in order to clean up some parts of her life. Her non-responsiveness leads to worry and wonder about whether something else is really going on. This book gave the idea that it was suspenseful but the suspense wasn't what drove me to keep turning the pages. There Hannah and Diane are identical twin sisters with an estranged relationship. When Diane shows up at the home of Hannah, which her daughter Mia, Hannah and her husband Mark do not understand what is going on. Diane leaves Mia for a few days in order to clean up some parts of her life. Her non-responsiveness leads to worry and wonder about whether something else is really going on. An easy to read book which I did enjoy this is a story of family, secrets, jealousy, grief, suicide and lies. The story flowed well but was a little slow in places. I was drawn in from the start - the first chapter was so shocking and I wanted to find out more. Heart wrenching in places, this is an emotional read. I liked the characters and how their stories developed throughout the book. I enjoyed the sections with the counseller which added greatly to the story. Highly recommended - I would gi An easy to read book which I did enjoy this is a story of family, secrets, jealousy, grief, suicide and lies. The story flowed well but was a little slow in places. I was drawn in from the start - the first chapter was so shocking and I wanted to find out more. Heart wrenching in places, this is an emotional read. I liked the characters and how their stories developed throughout the book. I enjoyed the sections with the counseller which added greatly to the story. Highly recommended - I would give this 4.5 stars if I could. Stuart lives in a village in North West England with his wife and daughter. There’s also his Former journalist S.D. Robertson quit his role as a local newspaper editor to pursue a lifelong ambition of becoming a novelist.